Do you love games like Tetris, but hate germs? If so, then the MicroCells game for Android is for you. 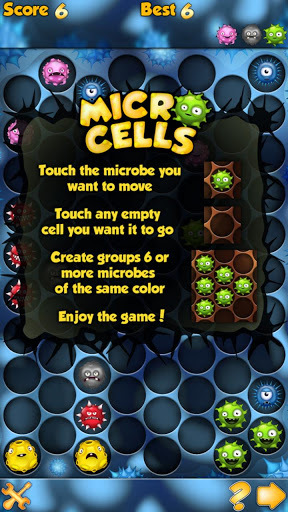 The premise is Tetris like, but instead of blocks you are matching up 6 or more microbes, all of the same color. When you get at least 6 together they disappear, but do not be fooled. They are cute, but they are evil and as soon as a group disappears more come out in full force. You have to work faster and harder to clear them out, and the game is over when the board if full of the germy little creatures. As you get them out of the way you earn more and more points, climbing the Swarm leaderboards and working toward your proper place as Master Germ Eradicator! Don't give up, you can do it! You can have as many chances as you want when you download. Take it with you and practice your microbe killing skills whenever you need to give your mind a break. Play under the table in a boring meeting, occupy yourself while waiting on the doctor, or just play in bed until you get sleepy. The microbes are waiting, anytime, anywhere, and they need to be killed. 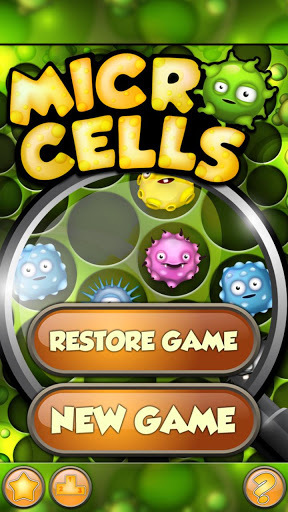 Head over to Google Play and download MicroCells by bootant for your Android device!